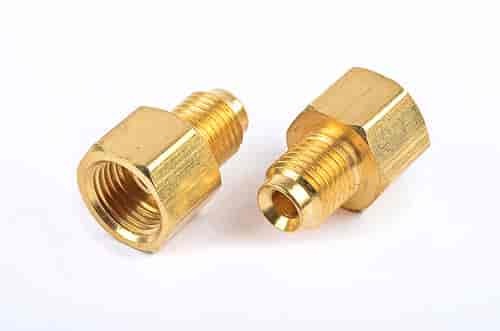 I would rather have these adapters in hand- looking for a link or part number from a knowledgable member- I don't know if there was a split in spec fron 88-98. I believe this is what you're looking for if you haven't found it already. Awesome. I may have to do this to my old reliable Tahoe. The brakes on those year GM trucks were poor. I hear changing the master cylinder is also a big help. Working at the -blank- proving grounds as a vehicle tester and specializing in brake testing I have wanted to do something about my truck, but did not like the idea of straying too far from factory stuff. This is a perfect option as it is all factory. I swapped out the front calipers to the 2500 units and did the rear conversion to S10 calipers with light duty rotors. Although they do work well with Hawk HPS pads, you lose the e-brake which cost me $$ to make a drive line e-brake- which doesn't work that well. What I find is the interface between different application parts don't really play well- example, occasionally I need to grind on the pads as they are a little offset from the rotors and a ridge develops that squeals. Pad compounds can really make a big difference. From having the opportunity to do testing on aftermarket pads I have a short list of pads that I recommend to people that I would/do use. For many reasons I like the idea of keeping the rear drums that I have now. Many rear disk setups don't do as much as I like and their integrated PKB are REALLY lacking. The drum in hat PKB work well enough, but the old drums work dang well. I look forward to doing the swap and being able to have factory style parts on it. That way I can find any part I need over the counter at my local auto part store.